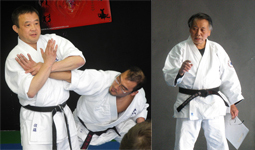 25.03.2012 Uno Sensei (8th Dan) and Satoh Sensei's (6th Dan) seminars and Dan grading in Sofia. On 16-18 March in Sofia, Bulgaria was held seminars and Dan grading by Kenshi Uno (8th Dan) and Tadayuki Satoh (6th Dan). With Bulgarian and Ukrainian Aikidokas also two members of our association, Vakhtang Sikharulidze and Lasha Rostomashvili attended this event. Vakhtang Sikharulidze successfully passed 4th Dan exam. Congratulations to them and wish more success in future!! !